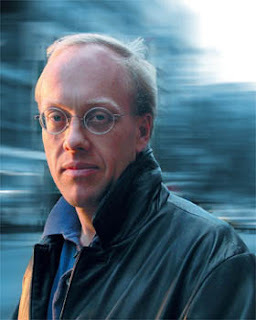 the nytpicker: Former Times Reporter Chris Hedges Reveals: "Why I Am A Socialist." Yikes! Former Times Reporter Chris Hedges Reveals: "Why I Am A Socialist." Yikes! Five years after leaving the Times -- after an illustrious 15-year career that included sharing in a 2002 Pulitzer Prize -- former reporter Chris Hedges has finally come completely clean about his political biases: he is a socialist. The Democratic and Republican parties have become little more than squalid clubs of privilege and wealth, whores to money and corporate interests, hostage to a massive arms industry, and so adept at deception and self-delusion they no longer know truth from lies. We will either find our way out of this mess by embracing an uncompromising democratic socialism—one that will insist on massive government relief and work programs, the nationalization of electricity and gas companies, a universal, not-for-profit government health care program, the outlawing of hedge funds, a radical reduction of our bloated military budget and an end to imperial wars—or we will continue to be fleeced and impoverished by our bankrupt elite and shackled and chained by our surveillance state. Shackled and chained! Sounds bad. These views probably don't come as much surprise to those who've followed Hedges's career closely. He left the Times in 2003, shortly after making a virulent anti-war commencement speech at Rockford College that led to a critical Wall Street Journal editorial. Since leaving the Times, Hedges has written several books -- including, most notably, "War Is A Force That Gives Us Meaning," a 2002 book that became a finalist for the National Book Critics Circle Award. Hedges's outspoken leftist views have filtered through much of his work since leaving the Times, including several books on religion. Life must be tough for Hedges. The Times is, of course, a corporation; he must have been seriously chafing under the shackles of the corporate overlord during his days on West 43d Street. It couldn't have been any easier for Hedges to hold the Anschutz Distinguished Fellowship at Princeton in the spring of 2006; Philip Anschutz, who helped endow the chair in 1997, is a well-known financier of conservative Christian causes, was recently ranked as the 31st-richest person in America by Forbes Magazine, and helped fund the 1992 Colorado constitutional initiative that overturned laws prohibiting discrimination against homosexuals. It's tough to be a socialist in the United States these days. We wish Hedges the best of luck.